On the 15 February 2018 from 6pm at the Grand Ballroom in Amara Singapore, there will be a one-time reunion dinner opened to all guests celebrating this Lunar New Year’s 2018 Earth Dog. Thereafter, guests can choose from a sumptuous line-up of culinary haven with affordable 8-course menus. The Golden Prosperity at S$68++ or Joyous Abundance at S$88 per person with a minimum of six persons per table. For guests that wish to enjoy extra posh and private dining experience, they can take up the Imperial Fortune reunion package at S$1,888++ for a table of 10 persons. This includes with a fully equipped family karaoke system. Apart from that menu is made interesting with dishes like sea urchin, black chicken ginseng soup and cod fish. 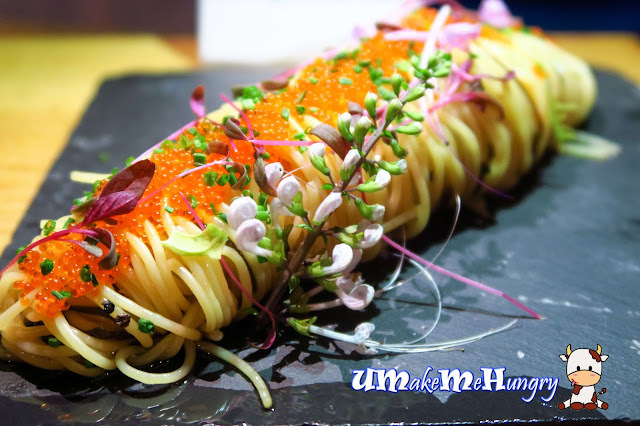 Kickstarting our CNY Buffet dinner with the ascetically coiled Angel Hair Pasta adorn with flowers and bright orange fish roes. Personally, this is my favourite of all Starters. Though chilled, the pasta was springy and had a pleasant whiff of truffle oil, it also marries well with the use of Kombu. 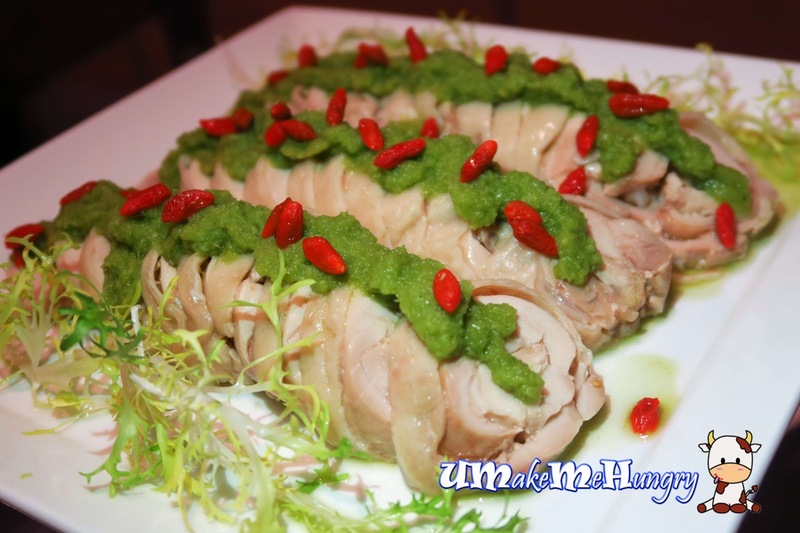 No, that is not Wasabi on top of the Drunken Chicken. In fact, these silky chicken was adorned by the use of ginger mix and wolfberries. Presentation in its color is definitely catchy. 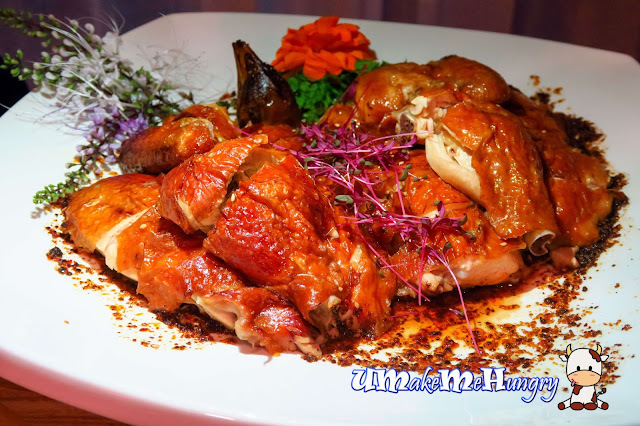 No strong alcohol taste here and chicken was pretty tasty in its juicy form, blending in well with the ginger mix..
As the saying goes "As Cool As a Cucumber", this was refreshingly prepared and dressed with Sesame and fish roes. Besides being crunchy, there was a twist to the taste with some spiciness. 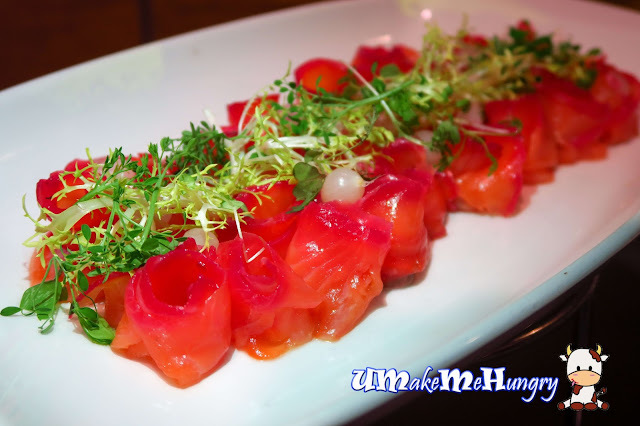 There are 2 kinds of Homemade dishes for Salmon and one of it is Beetroot Salmon. We know the benefits of beetroot and some even turned off by the taste of such healthy root. Surprisingly, the beetroot taste was still alright. When the orange meets the orange! 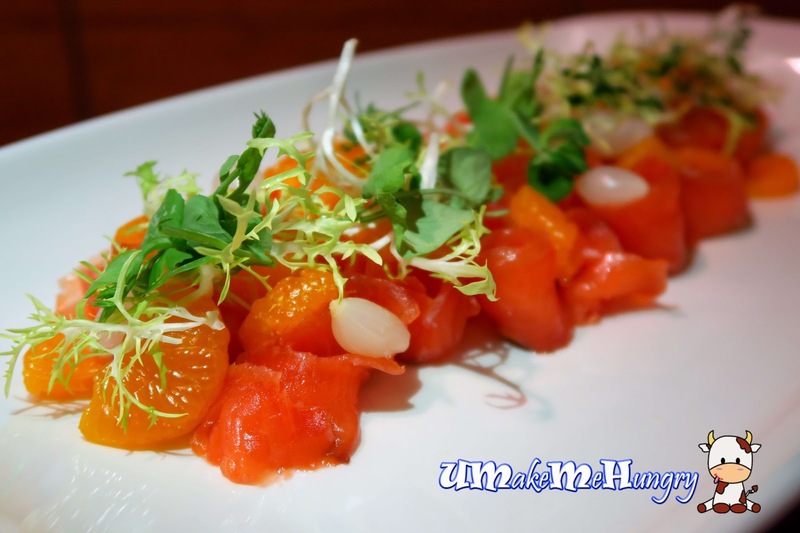 The use of Sweet tangy orange with salmon was great. Seafood lovers, these Black Pepper Crayfish might be a take. Meat was plump and fleshy. 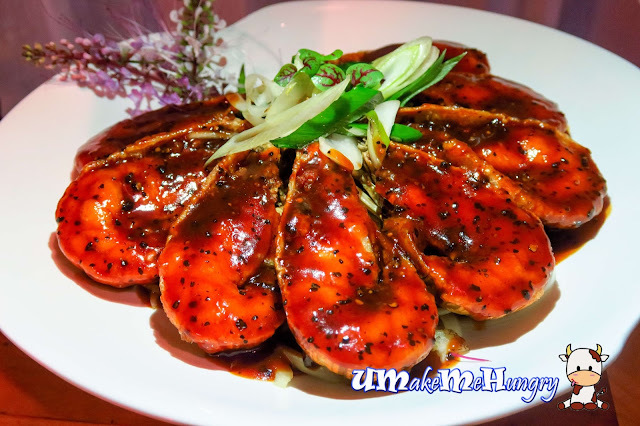 The sauce brings a tad sweetness and was not too peppery on the crustacean. 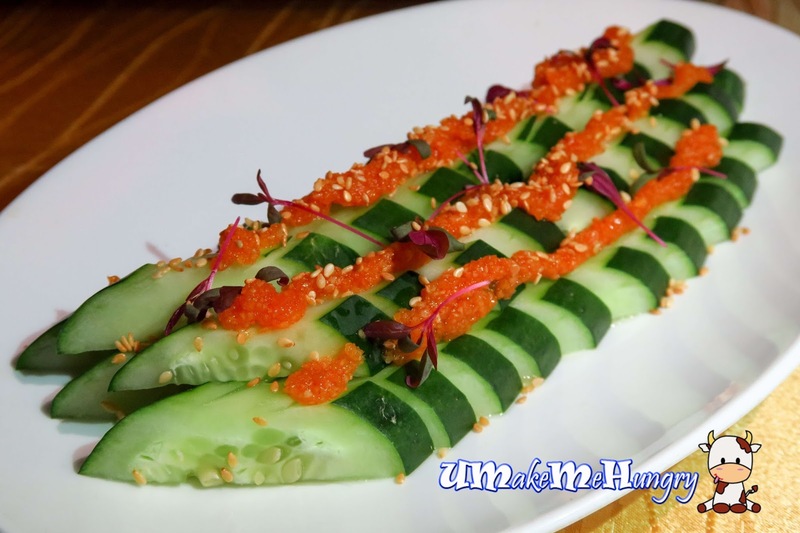 Pen Cai has a good significance for the Chinese New Year and it represent abundance and richness. Over the years, it had grown its popularity and comes in different varieties. This is one pot Chinese dish of Cantonese origin is traditionally served in large wooden, porcelain or even metal basins due to the communal style of consumption and I believe this is how the dish name "盆菜" came about. To buy this separately, the standard size will cost $188 while the larger size at $288. They do have Non-Vegetarian Pen Cai available too. Here comes the Roasted Chicken in Spicy Sichuan Sauce. 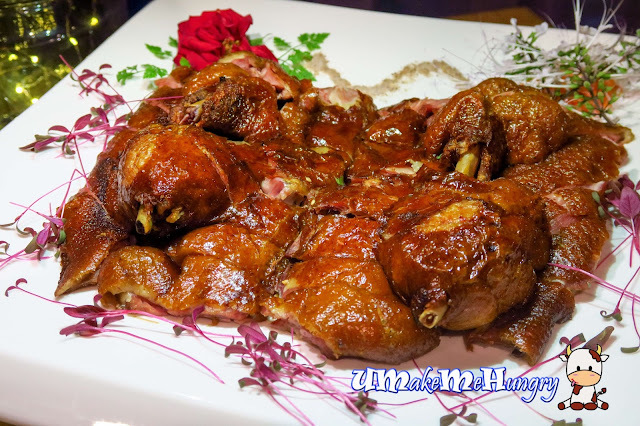 The chicken was nicely roasted to its golden brown crispy skin and tasted good. Smoked duck was infused with Camphor and Tea Leaves. Tasted not too bad. Pretty popular during the dinner as those plump asparagus was wiped up soon we reach the dish. 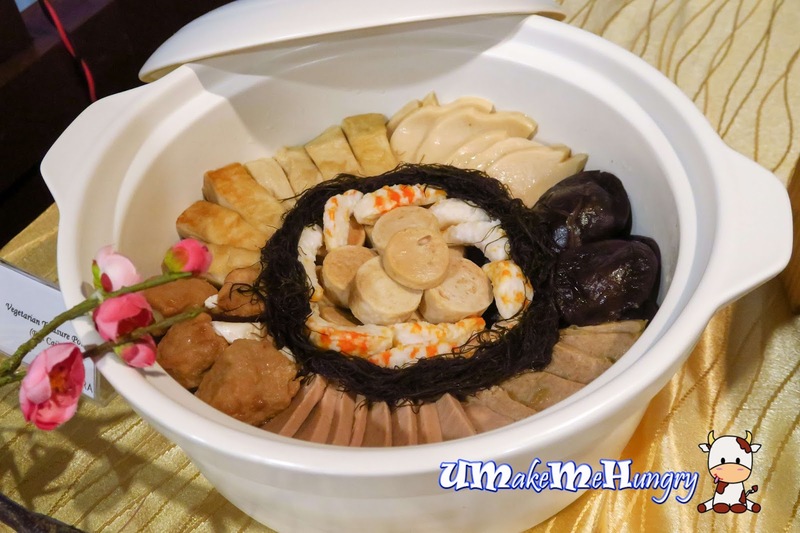 Nevertheless, this this was kind of unique on its own apart from other CNY dishes we are expecting. 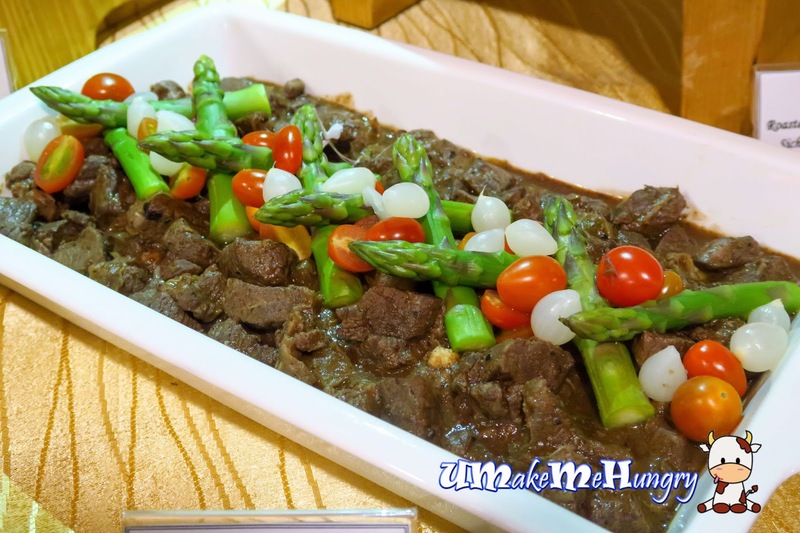 Beef was tender and do not have any gamy taste. It was served in good bite size chunks. A Chinese New Year celebration can never be completed without "Lou Hei". 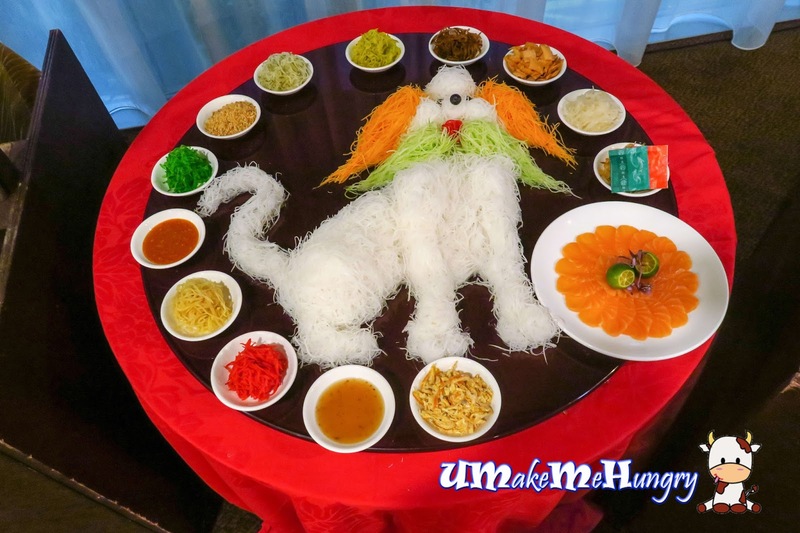 The CNY Chinese Reunion dinner packages include the Salmon Yu Sheng Set which was specially arranged in the Shape of the Dog. Prices are at $68 for standard size and $88 for a larger size. 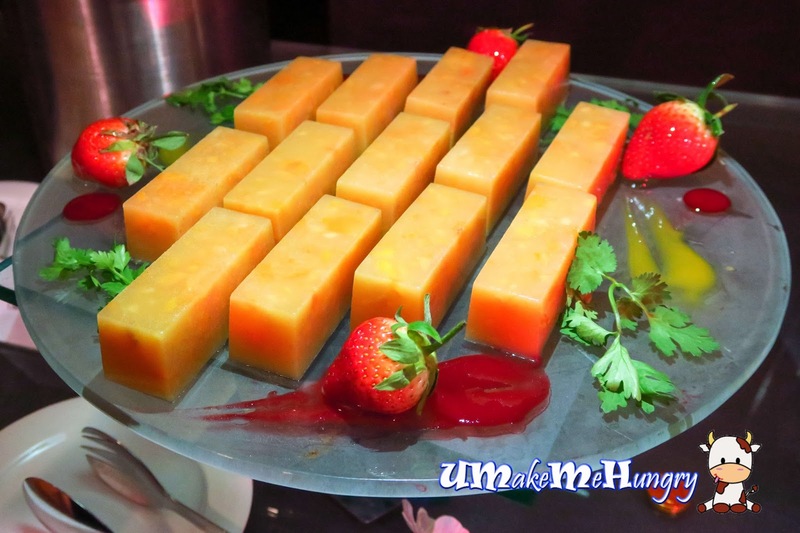 It's the season for Chempedak and the chef had taken this opportunity to present desserts that make up of this fruit. I was overwhelmed with the fragrant of this tropical fruit and a varieties of dessert made from it. I thought it was a very daring try by the Chef to invent this. 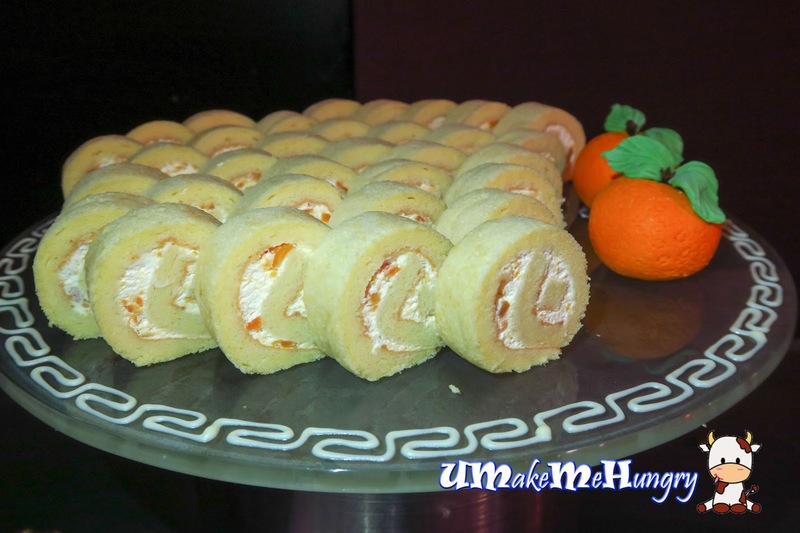 Swiss Roll was pillow soft and fluffy with cream and chempedak chunks as fillings. Perhaps this is my favourite out of all desserts. Simply love the texture and bite from the Agar Agar. It will be better if I can have it chilled. 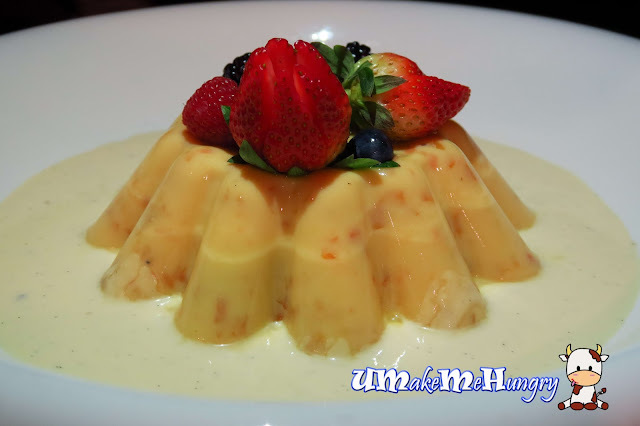 Pudding was wobbly and filled of Chempedak bits. It tasted good with milk and was topped with assorted berries like blue berries, strawberries, raspberries and black berries. 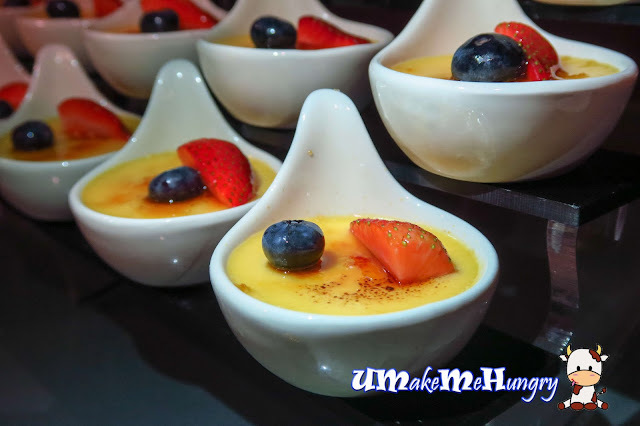 Take your portion of Creme Brulee topped with berries! Sweet! 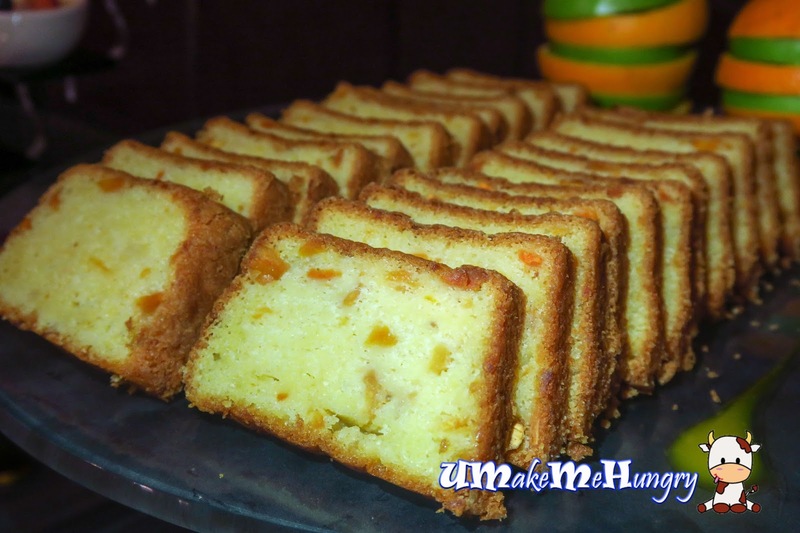 Last but not least, presenting Butter Cake with Chempedak Bits and packed of its fragrance. 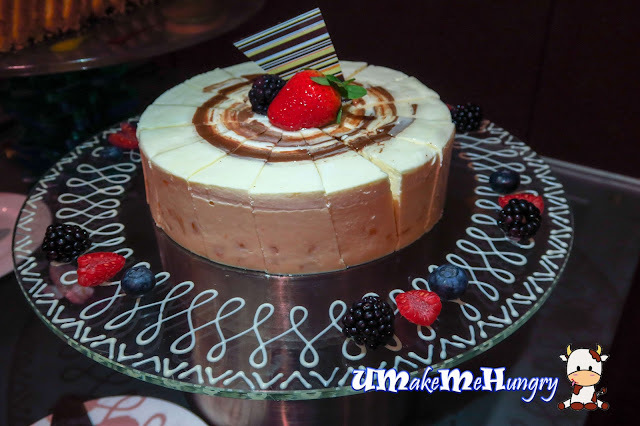 However, it can be better if the cake can be a little bit more moist. Only the Pomelo Tang Yuan is exempted from the Chempedek taste. 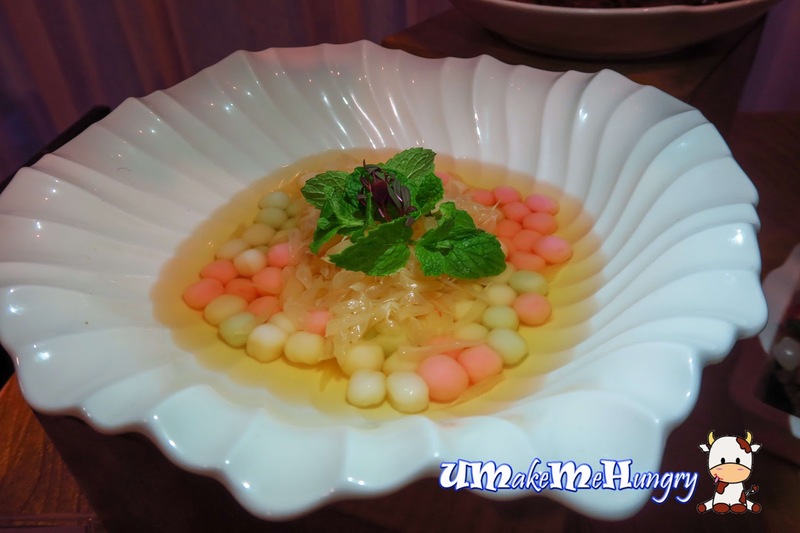 Marking the customary occasion, every guest will be served this special rendition Chinese Festive Dessert, Tang Yuan. This little balls was prepared in sweetened soup with Pomelo fleash and mint leaves. Many thanks to Amara Singapore and Lindy for the invite.